Join Barbie in a colourful, modern-day fairytale filled with fashion, friends and fun! Barbie and her dog Sequin jet off to visit her Aunt's amazing fashion house in Paris, and much to her surprise it's about to be shut down forever. 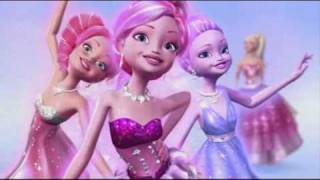 After she discovers three enchanting Flairies with sparkle-magic powers, Barbie comes up with a brilliant idea to save the business. She even inspires Alice, a shy fashion designer, and together they create a dazzling runway fashion show. Barbie shows that magic happens when you believe in yourself. You can buy "Barbie: A Fashion Fairytale" on Apple iTunes, Google Play Movies as download or rent it on Apple iTunes, Google Play Movies online.